How many calories in Goat cheese? See below, the Goat cheese calories for the different serving sizes. We provide you with Goat cheese nutrition facts and the health benefits of Goat cheese to help you lose weight and eat a healthy diet. Goat’s cheese is generally a soft white cheese, made from goat’s milk. Goat’s cheese is high in fat, approx. 21g per 100g, although a lot less than some other cheeses, but should not be considered if your aim is to lose weight. It provides a good source of vitamins A, B1-B3, B5, B6, B12, D, E, K, calcium, protein, and phosphorus as well as other minerals. Goat’s cheese is great for the health of our teeth and bones. 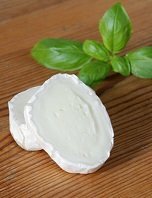 Other Goat’s cheese benefits are thought to include protection against heart disease and the benefits that come from probiotics (good bacteria). Cheese in general contains conjugated linoleic acid (CLA). Studies of CLA have shown that it helps with weight loss. Whilst we don’t generally recommend supplements as we believe all nutrients and vitamins should come from eating healthily, this is one supplement you may want to consider if you are giving up cheese as part of your weight loss program. Compare Goat cheese calories with the other calories in cheese and dairy products. This asparagus and goat`s cheese frittata recipe provides 191 calories, is a good source of vitamin A, folate, riboflavin, is suitable for vegetarians and diabetics, and is gluten free. Also, it is low in carbs, and sodium, low GI and high in protein. This yummy grilled Chevre Blanc goat`s cheese and vegetable salad is quick and easy to make and only takes 20 min. 437 calories in one serving, high in copper, riboflavin, phosphorus, vitamin A, B6 and C. The recipe is low in carbohydrates, glycemic index, cholesterol and is vegetarian.